Welcome, thank you, and I hope that those who have been appointed as bishops have not lost the capacity to be merciful. This is important. 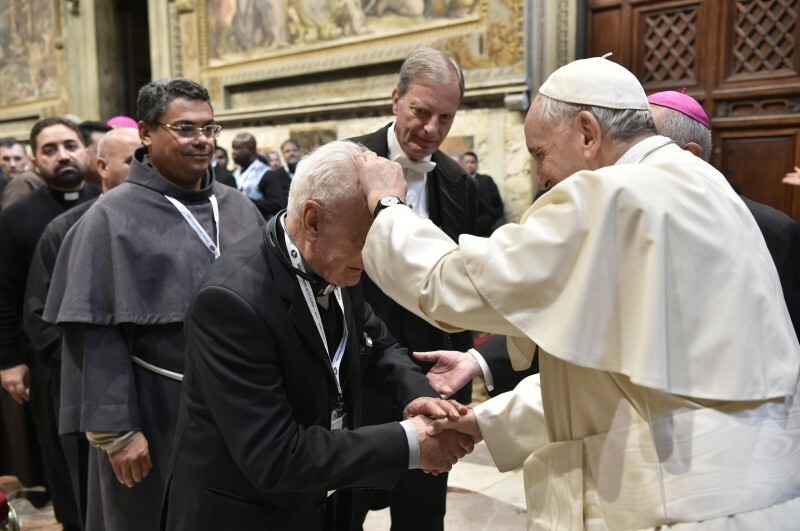 For me, it is a joy to meet you after the beautiful experience of the Jubilee of Mercy. As you well know, at the end of that extraordinary Jubilee your ministry should have come to a conclusion. However, reflecting on the great service you have rendered to the Church, and on how much good you have done and offered to so many believers with your preaching and above all with the celebration of the sacrament of Reconciliation, I considered it appropriate to extend your term for a little longer. I have received many testimonies of conversions realized through your service. And you are witnesses to this. Truly we must acknowledge that God’s mercy knows no bounds, and with your ministry, you are a concrete sign that the Church cannot, must not and does not wish to create any barrier or difficulty that may hinder access to the Father’s forgiveness. The “prodigal son” did not have to pass through customs: he was welcomed by the Father, without obstacles. I thank Msgr. Fisichella for his words of introduction, and the collaborators of the Pontifical Council for New Evangelization for having organized these days of prayer and of reflection. I extend my thoughts to those who have not been able to come, so that they may, in any case, feel they are participants and so that, though from a distance, my appreciation and thanksgiving may reach them. I would like to share some reflections with you to give greater support to the responsibilities that I have placed in your hands, and so that the ministry of mercy you are called to live in an entirely particular way may be best expressed, according to the will of the Father whom Jesus has revealed to us, and who in the light of Easter acquires its fullest meaning. And with these words – my address may be a bit long – I would like to underline the doctrine of your ministry, which is not an idea – “let’s have this pastoral experience and then we’ll see how it goes” – no- It is a pastoral experience that has a true doctrine behind it. A first reflection is suggested to me by the text of the prophet Isaiah where we read: “In the time of my favor I will answer you, and in the day of salvation I will help you For the Lord comforts his people and will have compassion on his afflicted ones. But Zion said, ‘The Lord has forsaken me, Can a mother forget the baby at her breast and have no compassion on the child she has borne? Though she may forget, I will not forget you!” (Is 49: 8, 13-15). It is a text steeped in the theme of mercy. The benevolence, the consolation, the closeness, the promise of eternal love: all expressions that intend to express the richness of divine mercy, without being able to exhaust it in a single aspect. Saint Paul, in his second letter to the Corinthians, returning to this text of Isaiah, updates it and seems to wish to apply it precisely to us. He writes thus: “As God’s co-workers we urge you not to receive God’s grace in vain. For He says, ‘In the time of my favor I heard you, and in the day of salvation I helped you’. I tell you, now is the time of God’s favor, now is the day of salvation” (2 Cor 1, 2). The first indication offered by the apostle is that we are God’s co-workers. How intense this calling may be is easy to confirm. A few verses beforehand, Paul had expressed the same concept, saying, “We implore you” – it seems he is on his knees – “on Christ’s behalf: Be reconciled to God” (5: 20). The message we, like ambassadors, bear on Christ’s behalf is that of making peace with God. Our apostolate is an appeal to try to receive the forgiveness of the Father. As you can see, God needs men who bring His forgiveness and His mercy to the world. It is the same mission that the risen Lord gave to the disciples the day after his Pasch: “Receive the Holy Spirit. If you forgive anyone’s sins, their sins are forgiven; if you do not forgive them, they are not forgiven” (Jn 20, 21-23). This responsibility placed in our hands – we are responsible for it – requires a style of life consistent with the mission we have received. It is again the Apostle who reminds us to act “so that our ministry will not be discredited” (2 Cor 6: 3).To be co-workers of mercy, therefore, presupposes living the merciful love that we experienced first. It could not be otherwise. In such a context, I think of the words Paul wrote at the end of his life, by now elderly, to his faithful collaborator Timothy, whom he left as his successor in the community of Ephesus. The Apostle thanks the Lord Jesus for having called him to the ministry (cf. 1 Tm 1: 12); he confesses to have been “a blasphemer and a persecutor and a violent man”; yet – he says – “I was shown mercy” (1, 13). I confess to you that many times, many times, I stop at this verse. “I was shown mercy”. And this does great good to me, it gives me courage. So to say, I feel it like the embrace of the Father, the caresses of the Father. To repeat this, for me personally, gives great strength because it is the truth: I too can say, “I was shown mercy”. The grace of the Lord was abundant in him; He acted so as to make him understand he was a sinner and, starting from there, made him discover the core of the Gospel. Therefore he writes. “This word is worthy of faith and of being received by all: Christ Jesus came to the world to save sinners, the first “Here is a trustworthy saying that deserves full acceptance: Christ Jesus came into the world to save sinners – of whom I am the worst. But for that very reason I was shown mercy so that in me, the worst of sinners, Christ Jesus might display His immense patience” (1: 15-16). The Apostle, at the end of his life, does not fail to recognize who he was, he does not hide his past. He could have made a list of his many successes, name the many communities he had founded… instead, he prefers to underline the experience that most struck him and marked his life. To Timothy he indicates the road to travel; to recognize God’s mercy first of all in one’s own personal existence. It is certainly not a matter of settling on the fact of being sinners, as if to want each time to justify, thus annulling the power of conversion. But we must always start from this fixed point: God treated me with mercy. This is the key to becoming God’s co-workers. One experiences mercy and becomes a minister of mercy. In short, the ministers do not place themselves above the others as if they were judges of their sinful brothers. A true missionary of mercy is reflected in the experience of the Apostle: God has chosen me; God trusts me; God has put His trust in me by calling me, despite being a sinner, to be His co-worker to make it real, effective and to allow His mercy to be touched by hand. This is the starting point, let’s say. Let us continue. Saint Paul, however, adds something extremely important to the words of the prophet Isaiah. How God’s collaborators and administrators of His mercy must pay attention not to nullify the grace of God. He writes: “We urge you not to receive God’s grace in vain” (2 Cor 6: 1). This is the first warning we are given: to recognize the action of grace and its primacy in our lives and people. You know that I really love the neologism primerear, to express precisely the dynamics of the first act with which God comes to meet us. The primerear of God can never be forgotten, nor taken for obvious, otherwise, the mystery of salvation achieved through the act of reconciliation that God accomplishes through the paschal mystery of Jesus Christ cannot be fully understood. Reconciliation is not, as we often think, a private initiative of ours or the fruit of our commitment. If this were the case, we would fall into that form of neo-Pelagianism which tends to overestimate man and his projects, forgetting that the Saviour is God and not us. We must always reiterate, but especially regarding the sacrament of Reconciliation, that the first initiative is of the Lord; it is He who precedes us in love. For this reason, the Church knows how to “move forward, boldly take the initiative, go out to others, seek those who have fallen away, stand at the crossroads and welcome the outcast. Such a community has an endless desire to show mercy, the fruit of its own experience of the power of the Father’s infinite mercy” (Apostolic Exhortation Evangelii Gaudium, 24). When a penitent approaches us, it is important and consoling to recognize that we have before us the first fruit of the meeting that has already taken place with the love of God, who with His grace has opened his heart and made it willing to conversion. Our priestly heart should perceive the miracle of a person who has met God and who has already experienced the efficacy of His grace. There could not be true reconciliation if this does not start from the grace of an encounter with God that precedes that with us confessors. This gaze of faith allows us to form well the experience of reconciliation as an event that finds its origin in God, the Shepherd, who as soon as He notices the lost sheep goes in search of it until he has found it (cf. -6). Our task – and this is a second step – consists of ensuring the action of God’s grace is not in vain, but supporting it and allowing it to come to fruition. Sometimes, unfortunately, it can happen that a priest, with his behavior, instead of approaching the penitent, dismisses him. For example, in order to defend the integrity of the Gospel ideal, the steps that a person takes day by day are neglected. This is not how God’s grace is nourished. Recognizing the repentance of the sinner is tantamount to welcoming him with open arms, to imitate the father of the parable who welcomes his son when he returns home (cf. Lk 15: 20); it means not letting him even finish his words. This has always struck me: the father did not even let him finish the words, he hugged him. He had the prepared speech, but [the father] hugged him. It means not letting him finish even the words he had prepared in order to apologize (see verse 22), because the confessor has already understood everything, strengthened by the experience of being a sinner too. There is no need to be ashamed to those who have already recognized their sin and know they have been wrong; it is not necessary to inquire – those confessors who ask, ask, ten, twenty, thirty, forty minutes … “And how was it done? And how? …” – it is not necessary to inquire where the grace of the Father has already intervened; it is not permitted to violate a person’s sacred space in his relationship with God. An example of the Roman Curia: we speak so badly about the Roman Curia, but inside there are saints. A cardinal, Prefect of a Congregation, has the habit of going to confession in Santo Spirito in Sassia two, three times a week – he has his regular schedule – and one day, explaining, he said: When I realize that a person begins to struggle to speak, and I have understood what it is, I say: “I understand. Go ahead”. And that person “breathes”. It is good advice: when you know what it is, “I understand, go ahead”. Here, the beautiful expression of the prophet Isaiah acquires its full meaning: “In the time of my favor I will answer you, and in the day of salvation I will help you” (49.8). In fact, the Lord always responds to the voice of those who cry out to Him with a sincere heart. Those who feel abandoned and alone can experience that God is meeting them. The parable of the prodigal son recounts that “while he was still a long way off, his father saw him and was filled with compassion for him; he ran to his son” (Lk 15,20). And he threw his arms around him. God is not idle to wait for the sinner: He runs to him, because the joy of seeing him come back is too great, and God has this passion to rejoice, to rejoice when He sees the sinner coming. It almost seems that God Himself has a “restless heart” until He has found His son who had been lost. When we welcome the penitent, we need to look him in the eye and listen to him to allow him to perceive the love of God Who forgives in spite of everything, He dresses him with the festive robe and the sign of belonging to his family (see v. 22). The text of the prophet Isaiah helps us to take another step in the mystery of reconciliation, where he says: “He who has compassion on them will guide them and lead them beside springs of water”. (49: 10). Mercy, which requires listening, allows then to guide the steps of the reconciled sinner. God frees from fear, anguish, shame, violence. Forgiveness is really a form of liberation to restore joy and the meaning of life. The cry of the poor who call for help corresponds to the cry of the Lord Who promises release to prisoners and to those who are in the darkness says: “Come out” (49: 9). An invitation to come out of the condition of sin to resume the garment of children of God. In short, liberating mercy restores dignity. The penitent does not hesitate to be pitied for the sin committed, and the priest does not blame him for the evil of which he repented; rather, he encourages him to look to the future with new eyes, leading him “to the springs of water” (cf. 49,10). This means that forgiveness and mercy allow us to look back at life with trust and commitment. It is like saying that mercy opens up hope, creates hope and nourishes itself with hope. Hope is also realistic, it is concrete. The confessor is merciful even when he says: “Go ahead, go, go”. He gives him hope. “What if something happens?” – You come back, there is no problem. The Lord is always waiting for you. Do not be ashamed to return, because the path is full of stones and banana skins for us to slip on. Saint Ignatius of Loyola – allow me a little bit of family promotion – has a meaningful teaching on this, because he talks about the ability to make God’s consolation felt. There is not only forgiveness, peace, but also consolation. In this way, he writes: “Inner consolation […] drives away all disturbance and attracts all to the love of the Lord. This consolation illuminates some, others discover many secrets. Finally, with it, all the pains are pleasure, all the rest work. To those who walk with this fervor, with this ardor and this inner consolation, there is not so great a burden that it does not appear light, penance or other pain so great that it is not very sweet. This consolation reveals to us the path we must follow and what we must escape – I repeat: this consolation reveals to us the path we must follow and the path from which we must flee. We must learn to live in consolation”. Ignatius continues, “It is not always in our power; he comes at certain moments determined according to God’s plan. And all this for our benefit” (Letter to Sister Teresa Rejadell, 18 June 1536: Letters 99-107). It is good to think that precisely the sacrament of Reconciliation can become a favorable moment for enabling the inner consolation that animates the path of the Christian to be perceived and to grow. And I have to say this: we, with the “spirituality of complaints”, run the risk of losing the sense of consolation. Also to lose that oxygen that lives in consolation. Sometimes it is strong, but there is always a minimum consolation that is given to everyone: peace. Peace is the first degree of consolation. You must not lose it. Because it is precisely that pure oxygen, without smog, of our relationship with God. Consolation. From the highest to the lowest, which is peace. I return to the words of Isaiah. We find the sentiments of Jerusalem that feels abandoned and forgotten by God: “Zion said: The Lord has forsaken me, the Lord has forgotten me. Can a mother forget the baby at her breast and have no compassion on the child she has borne? Though she may forget, I will not forget you” (49: 13-15). On the one hand, this rebuke to the Lord for abandoning Jerusalem and His people seems strange. With much more frequency, we read in the prophets that it is the people who abandon the Lord. Jeremiah is very clear about this when he says: “My people have committed two sins: They have forsaken me, the spring of living water, and have dug their own cisterns, broken cisterns that cannot hold water” (2: 13). Sin is abandoning God, turning one’s back on him to look only at oneself. A dramatic self-confidence, which makes cracks on all sides and is not able to bring stability and consistency to life. We know that this is the daily experience that we live in first person. And yet, there are moments when one really feels the silence and abandonment of God. Not only in the great dark hours of humanity in every age, which give rise to many questions about the abandonment of God. I am thinking now of Syria today, for example. It happens that even in personal events, even in those of the saints, one can experience abandonment. What a sad experience, that of abandonment! It has different degrees, up to the definitive detachment for the arrival of death. Feeling abandoned leads to disappointment, to sadness, sometimes to despair, and to the various forms of depression that many suffer from today. And yet, every form of abandonment, paradoxical as it may seem, is inserted within the experience of love. When one loves and experiences abandonment, then the trial becomes dramatic and suffering has traits of inhuman violence. If it is not inserted in love, abandonment becomes meaningless and tragic, because it does not find hope. It is, therefore, necessary that those expressions of the prophet on the abandonment of Jerusalem from God be placed in the light of Golgotha. The cry of Jesus on the cross: “My God, my God, why have You forsaken me?” (Mk 15: 34), gives voice to the abyss of abandonment. But the Father does not answer Him. The words of the Crucifix seem to resonate in the void because this silence of the Father for the Son is the price to pay so that no-one may feel abandoned by God. The God Who loved the world to the point of giving His Son (cf. Jn 3, 16), to the point of abandoning Him on the cross, He will never abandon anyone: His love will always be there, close, bigger and more faithful than any abandonment. Isaiah, after reiterating that God will not forget His people, concludes by saying: “See, I have engraved you on the palms of my hands” (49.16). Incredible: God has “tattooed” my name on His hand. It is like a seal that gives me certainty, with which He promises that He will never stray from me. They are always before Him; every time God looks at His hand, He remembers me, because He has engraved my name there! And let us not forget that while the prophet writes, Jerusalem is really destroyed; the temple no longer exists; the people are slaves in exile. Yet the Lord says: “Your walls are ever before me” (ibid). On the palm of the hand of God, the walls of Jerusalem are solid as an impregnable fortress. The image also applies to us: while life is destroyed under the illusion of sin, God keeps His salvation alive and comes to meet with His help. On His fatherly hand, I find my life renewed and projected towards the future, full of love that only He can realize. The book of love also returns to the mind, the Song of Songs, where we find an expression similar to the one recalled by the prophet: “Put me as a seal on your heart, as a seal on your arm” (8: 6). As we know, the function of the seal was to prevent something intimate from being violated; in ancient culture, it was taken as an image to indicate that love between two people was so solid and stable that it continued beyond death. Continuity and perenniality are at the basis of the image of the seal that God has placed on Himself to prevent anyone from thinking of being abandoned by Him: “I will never forget you” (Is 49: 15). A seal, a tattoo. And so I will finish. It is this typical certainty of the love that we are called to support in those who approach the confessional, to give them the strength to believe and hope. The ability to be able to start over again, despite everything, because God takes us each time by the hand and pushes us to look forward. Mercy takes our hand and infuses with certainty that God’s love defeats every form of solitude and abandonment. The Missionaries of Mercy are called to be interpreters and witnesses of this experience, which is inserted in a community that welcomes everyone, always, without discrimination, that sustains anyone in need and in difficulty, that lives in communion as a source of life. may you obtain your mercy.